We are currently adding photos from Streatham Jewish Cemetery. These are being added in an ‘uncut’ format meaning that we have not, as yet, researched the individuals and added them to our main database. As there has been a great deal of interest we took the unusual decision to list the photos with just names and year of death, where they can be read. Once we have added them all we will then add the full details and inscriptions to our main database. For genealogy research these photos and information are a goldmine, often providing both the individuals’ original family name and the adopted, perhaps more English, name. There are also many memorials to those lost during WW1, WW2 and civilian casualties. See http://www.cemeteryscribes.com/showmap.php?cemeteryID=137&tree=Cemeteries Each are listed alphabetically and are not yet searchable other than by going through the pages. The photos are from the collection taken by Mr L Saunders, jazz musician, who has called it a labour of love. Visiting the cemetery in all weathers and when his busy work schedule allowed. We are very grateful to Lynn for providing us with these photos and making them available to others via our website. If it is open, I would also like to find out where exactly they are buried. Their names are Naftoli & Rachel Podkaminsky & they both died circa 1960 give or take 1 year. Forename	Surname	Date	Location	Section	Row	NO. As far as I know access is fine but do avoid the Jewish holidays, September is a busy month, see http://www.westerncharitablefoundation.com/contact/ for contact details and also to search their burial lists. 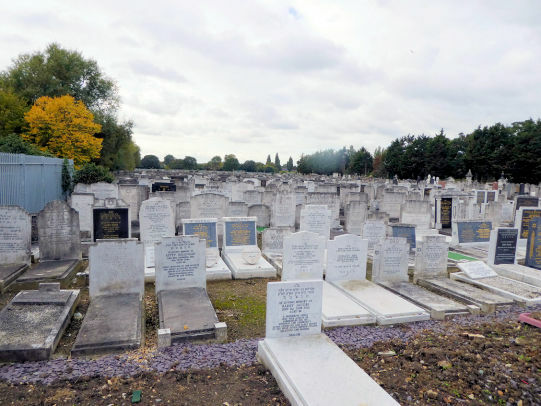 Could you tell me whether there are Jewish people buried in the Streatham Jewish Cemetery with Dutch ancestry/names? I am not sure how one would tell if anyone buried there is of Dutch ancestry, names can and were changed, others such as Cohen or Levy would not indicate a place of origin etc etc but you are welcome to look through those listed on our site to see if you think they may have been Dutch. Hi my grandparents are buried in this cemetery. Betty and Charles Mitelle. I wondered if I could be buried with them and what I would have to do to make this happen. Thank you for contacting us however you would need to speak to the Burial Society or Cemetery for this information. My Great Grandparents are both buried there in the 20’s I think! Graves unmarked with a stone! Lion de Swarte and Caroline de Swarte. Mentioning also to enquirer asking about Dutch names! They were both originally from Amsterdam and lived for many years in Streatham. He was a musician, published composer and arranger. I would like the numbers of the plots if possible? My great grandfather, Israel Isaac Rosenkrantz, died in London on 10 November 1921. We believe he is buried at Streatham (was Streatham once called “West End cemetery?). Do you have the exact location of his grave, and/or a photo? Many thanks from Beth in New Orleans, Louisiana. Is the cemetery open to visitors? If so, how long would it take to get there from Tower Hill? And how long would it take, approximately? Yes its open, outside of religious holidays/festivals etc. Hello, I’m trying to find my maternal grandmother’s grave. Her name was Doris Tessler née Caplan. She died around 1944/45. Hyman Koski was buried at Streatham in April 1940 Section F Row 24 No 45. His son Eric is 85 and doesn’t remember his or his father’s Hebrew names. Is there any way of finding this information from the cemetery records? Is there a photo of the grave site? Any help very gratefully received. Is Streatham cemetery open on Bank holiday Monday 27 August 2018. Hello. I think my husbands family are buried in Streatham Jewish Cemetery. Their names are Blanche Krutnick, her husband is there but cannot remember his hame, and also Henry Krutnick. Can you please tell me if they are actually in this Cemetery and the plot numbers? My great great grandfather apparently buried at streatham jewish cemetary 1919. I wanted to know what it says as the name of my great grandfather Morris Ginsberg or Ginsburg whom I believe was Yisrael Moshe and died between 1902 and 1935.I doubt he was a Cohen or Levi since I’m not but am curious whether he was and we somehow lost the tradition. There is a Morris Ginsberg who died in Feb 1931 buried at Streatham. My great grandparents Joseph and Reshi Lewis are buried at Streatham. I have seen photos of there headstones but I cant find them on the database when I search? I also understand my grandfather Mordecai (Max) Lewis is also buried here but there is no longer a headstone. I want to visit but wondered if it will be difficult locating their graves. Please take a look at http://www.westerncharitablefoundation.com/database/search/ you can search there and also contact them direct. Are there photographs of my grandparents graves. They are Julia and Solomon Boyd. Their dates of death are 20.1 53 and 20.1.50 respectively. Sorry we don’t have photos of these tombstones. Perhaps contact the cemetery direct. I’m at the cemetery looking for the grave of Mrs Jessie Witzer. can you help me please?